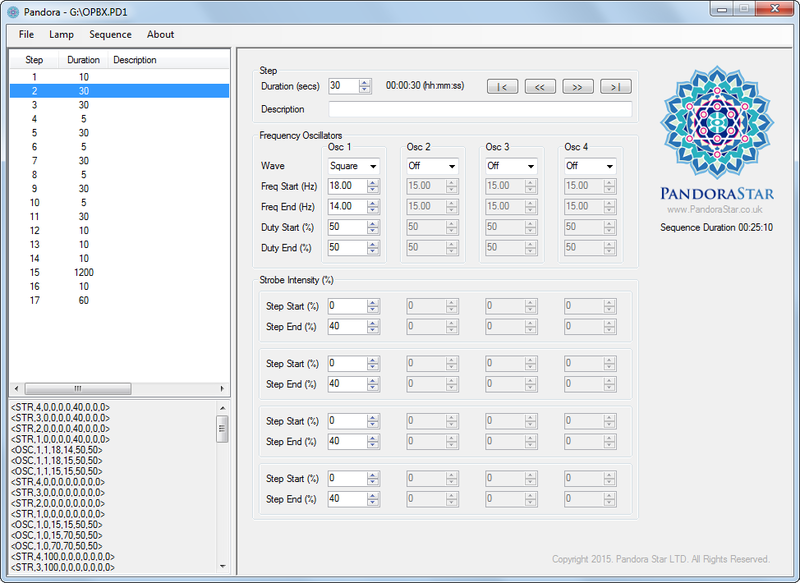 is a Windows based editor used to create and modify sequence files for the PandoraStar lamp. The user interface enables sequences to be created with ease that can last from a few minutes in duration, up to many hours; with file management options for new, open, save and save-as enabling sequences to be created from new, copied from existing, edited or updated as required. Sequences are built up from a series of sequential steps, where each step can be configured to allow for the light intensities of the strobe lamps to be distributed and harmonised through different frequencies, waveforms, duties and intensities. Created sequence files are (ordinarily) stored on the PandoraStar lamps integrated USB flash drive so that they can be selected, played and stopped directly from the lamp without the need for a personal/laptop computer. A simple 2 x 16 character liquid crystal display (LCD) interface and push button enables full control of all preloaded sequences on the lamp making PandoraStar highly portable. Sequence file selection is toggled by simply pressing the push button, and can be played by pressing and holding the button for 2 seconds or stopped immediately by simply pressing the button again. Upon toggling to a new sequence the LCD shows the number of steps in the sequence and the total run time; when the sequence is played the LCD shows a real time step counter and run/play time.